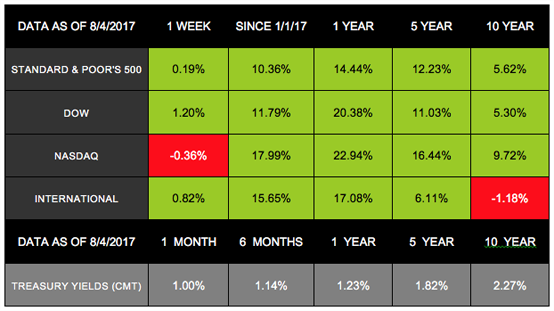 Another week of economic performance brought more news that the markets continue their bullish streak. After eight consecutive record-high closings, the Dow rose above 22,000 for the first time ever and finished the week up 1.20%. The S&P 500 was up 0.19% for the week, and the NASDAQ slightly fell by 0.36%. Meanwhile, the MSCI EAFE closed with a 0.82% increase. The positive news continued with other upbeat reports. Manufacturing and employment each posted impressive numbers, suggesting a favorable Q3 start. And investors are looking ahead to possible Fed action on unwinding its balance sheet and bumping interest rates up again in December. Manufacturing is gaining speed as a key economic factor for Q3 and Q4. In June, new factory orders rose to almost a 10% annual increase, the best rate in the last 3 years. Unfilled orders also jumped 1.3% on rising demand for transportation equipment and capital goods. In addition, business confidence is at a 6-month high and inventories are up, though inflationary pressure remains soft. As a result, factory payrolls jumped 16,000 in July on top of June's 12,000 increase. Last Friday's Employment Situation report marks the 5th time this year that payroll growth surpassed 200,000. While analysts predicted payrolls would grow by an additional 178,000, the actual number came in at 209,000. The solid employment increase helped lower the unemployment rate to 4.3% - the best rate since 2001. Average hourly earnings also rose last week. The welcomed 0.34% increase on the month was the highest increase since October. Analysts hoped that low unemployment numbers would push yearly wage growth to over 3%, but year-to-date numbers continue to hover around growth of 2.5%. Expect the Fed to raise interest rates in December by an additional ¼ point, though Fed Chair Janet Yellen has indicated that low inflation remains a concern for the economy. Despite robust financial markets, low unemployment, and a flourishing job market, inflation sits below the targeted 2% increase, with modest increases in both wage growth and consumer spending. Some analysts think that soft inflation could give pause to a year-end Fed rate hike. Many observers believe the Federal Reserve will begin in September to shrink its $4.5 trillion balance sheet. The Fed balance sheet consists primarily of U.S. treasury bonds and mortgage-backed securities. To reduce this position, the Fed can either sell those securities, or it can opt not to reinvest securities as they mature. Solid Q2 corporate earnings continue to impress the markets. Consumer sentiment is exceptionally high on the economy, personal finances, and individual companies. Pending home sales are on the rise and suggest optimism for July and August existing home sales numbers. Auto sales provide an early indicator of a minor and needed boost in consumer spending, as unit sales moved higher in July and may continue. In addition, economies around the world are moving in the right direction. The euro economies are showing continued strength, while emerging economies are expanding at their fastest rate since 2014. As always, we encourage you to continue focusing on your long-term goals. Should you have any questions about the economy or your financial life, we are here for the conversation. Securities and investment advisory services offered solely through Ameritas Investment Corp. (AIC). Member FINRA/SIPC. 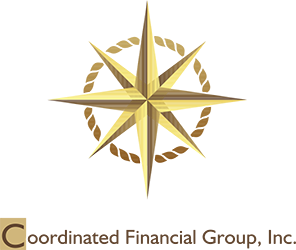 AIC and Coordinated Financial Group, Inc. are not affiliated. Additional products and services may be available through Coordinated Financial Group, Inc) that are not offered through AIC. This is not an offer of securities in any jurisdiction, nor is it specifically directed to a resident of any jurisdiction. As with any security, request a prospectus from your registered representative. Read it carefully before you invest or send money. Securities products are limited to residents of Texas. A representative from Coordinated Financial Group, Inc. will contact you to provide requested information.